Collaborative Research Centre 958 "Scaffolding of Membranes - Molecular Mechanisms and Cellular Functions"
Spatiotemporally controlled assembly of protein scaffolds at membranes plays crucial roles in membrane traffic and remodelling, cell signalling, as well as in differentiation and development. The collaborative research centre aims at elucidating the molecular mechanisms by which dynamically organized protein-protein assemblies scaffold cellular membranes and exert cellular functions. Protein assemblies forming membrane-based scaffolds may be viewed as metastable structures that form an avidity-based multi-component matrix. How the scaffolding function arises from the dynamic interplay of protein complexes and their interaction partners in most cases is unknown. The collaborative research centre will tackle this problem using convergent multidisciplinary approaches. These include advanced and super-resolution imaging techniques to visualize the organization of membrane-associated scaffolds, structural biology and proteomics to obtain insights into the molecular architecture of proteins and protein assemblies, and powerful genetic or cell biological manipulations to study and perturb the function of select components in living cells or in vivo. Such experimental approaches will be paired with theoretical modelling to unravel the underlying principles of how protein assemblies scaffold cellular membranes and how this is regulated in time and space. Figure 1: Scaffolding of membranes. 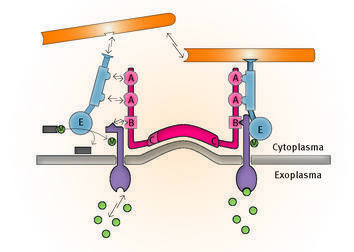 Scaffolding of membranes often is achieved by the dynamic assembly of usually peripheral multidomain (A-C) membrane proteins (red) that recruit adaptors or enzymes (blue, E), which link membrane dynamics to cell signalling, e.g. by covalent modification (M) of transmembrane receptors (purple, R). Frequently, such dynamic protein assemblies are stabilized by further proteinaceous polymers or coats (orange) and form a multi-component matrix, which organizes the underlying membrane domain in time and space.